In order to post to the blog, you must be a "registered contributor." All ANR academics and staff with an interest in writing are invited to be contributors. To be added, just send an e-mail to jewarnert@ucanr.edu. If you are a registered contributor, a section titled "Blog System" will appear in the center column of your ANR Portal. Click "Food Blog" or "Green Blog"
Click "Create/edit post" on the lower right-hand side of the page, under "My stuff." The system first asks you to write a headline. The headline can be edited later, if you wish. 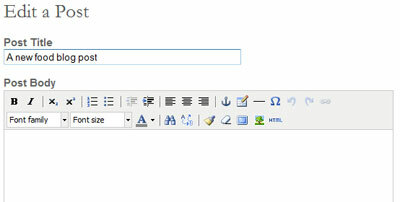 The top of the next pane says "Edit a post," but this is where you first write the post as well. If you have already written the post elsewhere, you can copy and paste it into the "post body" pane. Many of the text formatting tools are the same as you would find in most word processing programs. Sometimes text will have hidden formatting that disrupts the flow of your copy. You can click the little icon that looks like an eraser to remove formatting. Links in your story ensure that it won't be a "dead end" for someone who stumbled upon the information using a search engine. Plus, it tells readers about the source of the information and shows where to go for more details. To add a link, copy the URL of the page you wish to link to into your clipboard. (Highlight the URL on the browser and click Ctrl-C on your computer keyboard.) Highlight the text you want to link in your post, then click the chain link icon on the far right side of the text box formatting tools. Paste the URL in the field titled "Link URL." Click "insert." To link an e-mail address, first copy the address in your clipboard, highlight the e-mail address in your copy, click on the chain link, then before pasting the e-mail address type "mailto:" (without the quotes.) Then paste in the address. To add a photo or video, use the "adding files" pane, just underneath the blog body. Click "browse" and find the photo or video on your computer. Click "edit" to the right of the file name. Here you can change the file name to an appropriate caption for the photo. Click the small square next to "caption" for the caption to appear on your post. Don't click the square if you don't want the caption to show. After editing the photo, place the cursor in the text where you would like the photo to appear and click "insert image," which is just to the right of the photo thumbnail. Tags are used to organize information on the blog. Below the picture pane is a field for adding tags. When typing in your tags, type slowly and the system will autofill. If you select an autofill tag, you know it's a category that already exists. Whenever you can, please use existing categories. Tag the names of your ANR sources. Don’t use a tag if you think it would very rarely or never again be mentioned in the blog. Tag with the word, not the acronym. “Asian citrus psyllid,” rather than ACP. Don't use too many tags. Four seems about right. After finishing your story, click "Save and Review." Reread the post, and click "re-edit this post" if you would like to make changes or corrections. When you are satisfied with the post, click "make this post live." The post will not immediately go live, however, since this is a moderated blog. After the post is reviewed by an editor and when the time for a new post has arrived, it will go live. If you have a hot story that should go live immediately, please e-mail jewarnert@ucanr.edu or text (559) 240-9850. The blog system makes it easy to share your information on social networking sites, like Facebook and Twitter. (You will need to first set up accounts on the social networking sites you wish to use.) Once the story is live on the blog, you will see a "share" icon on the upper right corner. Click the icon, select the social networking site of your choice and follow the simple directions to add your post (or anyone's post that interests you) to your social networking site.